US - MSD Animal Health (known as Merck Animal Health in the USA and Canada) have announced the launch of the Convenience Program Evaluation. This innovative new poultry health field service, is a new addition to the company’s Convenience Program, an initiative design to help poultry producers protect chickens against various diseases while achieving optimal vaccination standards, bird quality and performance goals. The Convenience Program Evaluation is designed to help producers troubleshoot disease outbreaks, optimise vaccination processes, and maintain the health of their poultry through the use of innovative and practical tools available through MSD Animal Health Representatives via mobile devices and toolkit. With the clear target of adding valued service to our customers and going beyond disease control, MSD Animal Health officially launched the Convenience Program Evaluation as a free service for poultry customers across the globe. “MSD Animal Health is committed to working with customers beyond disease control, with product offerings to provide services and solutions that substantially improve vaccine efficacy and promote optimal poultry health,” said William Vaughn, Global Marketing, Poultry, MSD Animal Health. Helping Producers Optimise Efficiency Producers can receive the benefits of the Convenience Program Evaluation by working with their local MSD Animal Health Representative. Together, they will assist in troubleshooting disease outbreaks, increasing the skill and knowledge of hatchery personnel, and building a database to analyse hatchery and first week of age process trends to improve chick quality. In addition, the tool provides information about vaccines, including a comprehensive outline of vaccine preparation and administration. 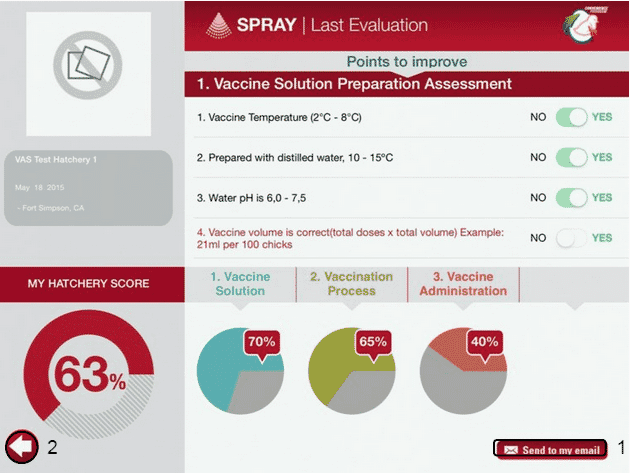 Through user-friendly design and support, the Convenience Program Evaluation can help producers identify ways to improve the vaccine administration process by examining trends and analysing results. Ultimately, as a part of the MSD Animal Health Convenience Program, the goal of the Convenience Program Evaluation is to ensure that producers are working vaccination into common practice beginning in the hatchery. Through a combination of in-ovo and day-old vaccination application, the Convenience Program process provides earlier and longer protection, without producing adverse reactions. The Convenience Program Evaluation allows producers to build a database that analyses hatchery process trends, most efficiently vaccinates their flock against harmful diseases, and improves overall poultry health.